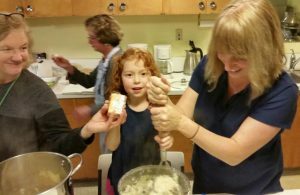 Since the reemergence of the SHARE shelter at Maple Leaf Lutheran Church (and the city at large), folks have returned to the Community Shelter Meal as one way to connect with residents. This month (November) the crew got some unusual support. Mom said, daughter, lets go cook it up for the residents. With a can do attitude, it was inspiring to see a young one step up and be a part of the big picture. The sit down meal with residents was well received. 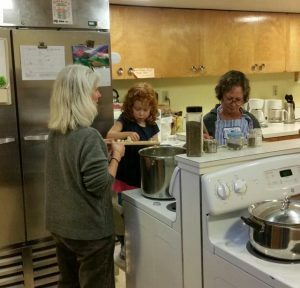 Residents as well as community ‘cooks’ enjoyed the ‘pint size’ help. 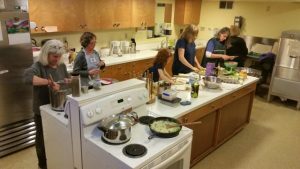 The effort was appreciated, as the experience gives all a positive moment to realize the scope and vision of sharing a meal with our neighbors in need. In May and June, as the meal planning for this group winds down for the summer, its moments like this one that gives all a boost for the coming season. If you and your community of folks would like to plan a meal for the residents any time of the year, let MC2 know and on the calendar it will go. Personalizing and engaging goes a long way for residents; more the merrier. Giving is not for just one time of the year. We welcome and support interest in the residents who reside at Maple Leaf Lutheran Church in Meadowbrook. Little details, little help, THX!